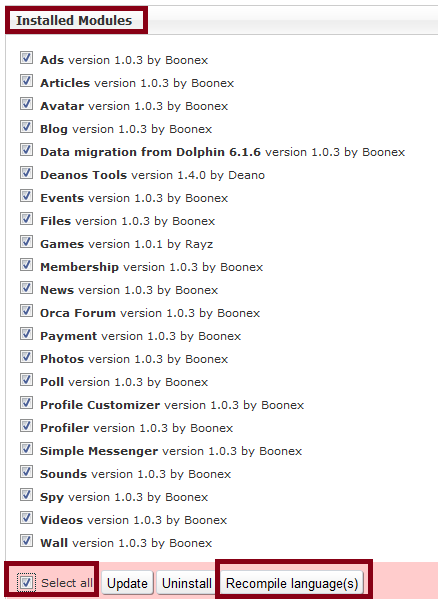 By now most of you have probably noticed Boonex released Dolphin 7.0.3 and an upgrade pack patch. There seems to be a few more steps involved with upgrading this time around. Nothing to difficult or out of the ordinary for the most part. I have Dolphin installed in another location just for testing and modifying purposes. I often use it to test out the upgrade process to see how things go. One of the most important things to do before you upgrade is to backup your site. You should download and backup both your files and your database. If you have a large site with a lot of content it could be time-consuming to download all the files. But, if something doesn't go quite right you are going to wish you had the backup. Don't rely on your host to keep daily backups on your behalf. A lot of hosts only do weekly backups. Which means you could potentially lose a weeks worth of files and data. Your best bet is not to rely on your host, and download the most current files and database yourself. Which is for the default en (english) and uni (default template). You might have more if you have other languages and/or other templates that would also need deleting. If your host uses mod_php (DSO) server setup these folders and the files inside them may be owned (99) by the server. If that is the case you might not be able to delete them. You might need to get your host to change the ownership to your account, delete them for you, or remove them using your hosts file manager in the control panel. Besides the upgrade instructions at Boonex when you run the upgrade it will also contain additional instructions you need to manually perform. So be sure you leave that page open so you can refer back to it. 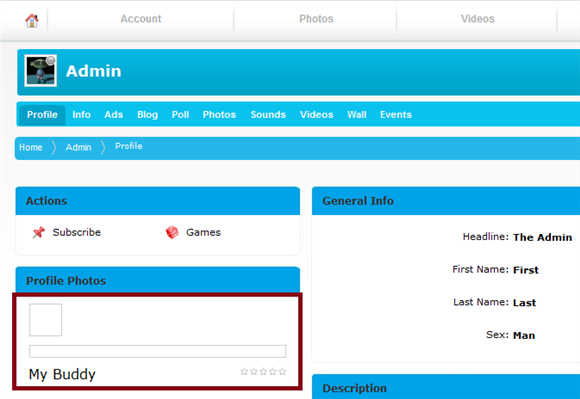 Basically it tells you to log into your Dolphin 7 Administration. -Go to Tools - Modules and tick or select all the modules you currently have installed and click the "Compile" button. 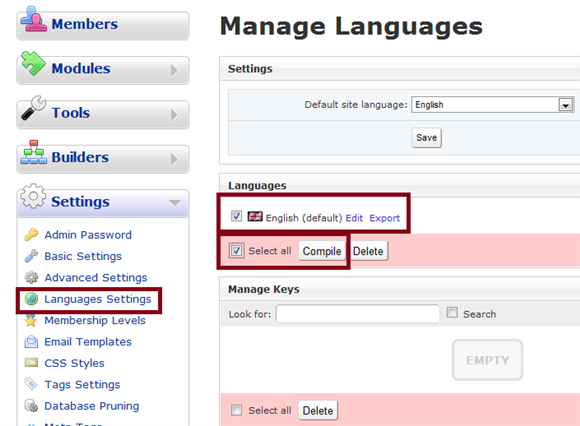 Then go to Settings - Language Settings select your language and "Compile" it. After that go to Modules - Orca Forum, navigate to manage forum and "Compile" the language file. And save the changes back to your server/host. Be sure you follow and complete both the Boonex Upgrade instructions and the important instructions the upgrade script tells you to do. You will need to delete some files in the final Step 8 in the Boonex Upgrade instructions page. 1. Spinning disk, broken links, and cache errors and issues. 2. Do not compile Orca Forum Language a second time for the same template. When you compile Orca Forum the first time things seem to work as expected. If you compile a second time the forum [[Brackets]] return and they don't seem to want to go away even if you remove all the folders/directories associated with them and try again. Why that is I am not sure yet, and what that will mean in the future should you need to compile/recompile Orca Forum language again I don't know yet either. For now only do it the one time. 3. 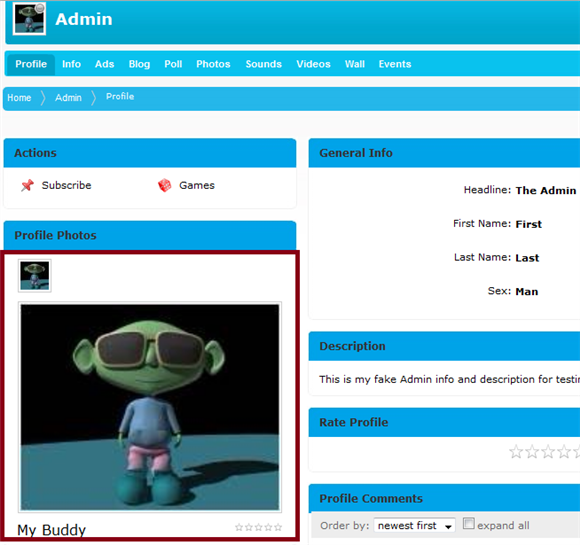 Photos/Images are not visible, show a red X, they may be visible when logged in as a member or admin, but not when you are logged out or a guest. You could compare the differences or changes to this particular file between Dolphin 7.0.2 and 7.0.3, but it is very large. Or, you might upload and use the HTMLPurifier.standalone.php file from Dolphin 7.0.2, 7.0.1 or even 7.0.0. Which isn't a solution, but more along the lines of a temporary fix to get you by. If you do not have this problem, then don't do this. There could be more these are just a few things I have come across in the short time that Dolphin 7.0.3 beta and stable has been out. If the upgrade doesn't go so well and/or you have problems or errors you might restore your Dolphin 7.0.2 database and try again. Read and follow the upgrade instructions carefully. If you continue to experience problems and can't get it to upgrade you can restore your 7.0.2 backup files and database so at least you are back to a working site. Then go over to Boonex Unity Forums and see if anyone else is having problems or has any suggestions. Post a question about the problem you are having or something you are not sure about.